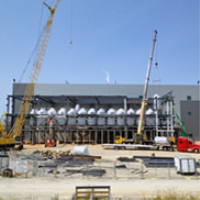 Grifols, the Spain-based specialist in blood plasma products, last year opened a $370 million plasma fractionation plant in Clayton, NC, but has now decided that is not enough to meet growing demand. It says it will invest $360 million to build out four projects to ensure it has the capacity it needs over the next 15 years, including two new facilities in Johnston County.. The company today said its plans call for spending $90 million on another fractionation plant at Clayton and then the rest on three purification plants to get the proteins its needs. It's building a $120 million purification plant at Clayton, an $85 million purification plant in Ireland and another $65 million purification plant in Spain. The new plasma fractionation plant at the industrial complex at Clayton will have a fractionation capacity of 6 million liters per year. That project is slated to begin the first quarter of 2017, with production online in early 2022. The purification plant for intravenous immunoglobulin (IVIG) at Clayton is scheduled to come into operation in late 2021. The purification plant for albumin at the Grifols facilities in Dublin, Ireland, will have a capacity of between 130 and 150 million grams/year of albumin. It is slated to come online in 2020. The company had earlier decided it would build a purification plant for alpha 1-antitrypsin at the Grifols site in Barcelona, Spain, because its current facility is near capacity. That purification plant is expected to be licensed in late 2017 or early 2018, Grifols said today. The company last year opened its new $370 million, 155,000-square-foot facility in Clayton, NC, doubling capacity there to 6 million liters from about 3.2 million. In 2014, it opened a 48,400-square-foot fractionation plant in Barcelona.